Your financial advisor may have told you of the potential benefits if you decide to have your LLC file an election to be taxed as either a corporation or an S corporation. This article discusses the benefits and process of filing such an election, and how to use Form 8832 for this filing. If you change the LLC's tax status to a corporation or S corporation, the legal status of the LLC remains the same. In other words, you still function as an LLC in every way except taxes. It's important to state upfront, that changing the tax status of a business is a complex issue and has potential tax and other effects you should be aware of. 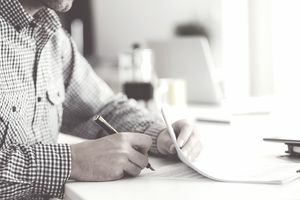 This article includes general information about the subject, but before you make any changes to the status of your LLC, discuss the benefits and drawbacks with your tax professional and tax attorney. A single-member LLC is considered a disregarded entity, and pays income tax as a sole proprietorship, through the member's personal tax return. A multiple-member LLC pays income taxes as a partnership. If you want your LLC to be taxed as a corporation, you must file IRS Form 8832 - Entity Classification Election. You can use this form to be taxed as a corporation, a partnership, or an entity disregarded as separate from its owner. The form allows "eligible entities" to file this election. LLCs are specifically stated to be eligible entities. The IRS uses the term "association" to mean "an eligible entity taxable as a corporation by-election...."
The form includes a consent statement which may be signed by all members, or by one member on behalf of all members. If one member signs, there should be some record in company membership meetings that all members approved this election. You must provide the name(s) and identifying number(s) of owners (Social Security Number for a single-member LLC, and Employer ID for multiple member LLC). The other tax option for your LLC is to elect to be taxed as an S corporation. Your LLC will need to meet the eligibility requirements of S corporation status. Both the LLC and S corporation are pass-through entities, meaning that the income of the business passes through to the owners. It allows the business to avoid the double taxation issue of corporations. It separates the owners from the business, allowing the owners to be employees, and having payroll taxes withheld from their income. This is a benefit to the owners if the LLC is profitable and the owners have high self-employment taxes (Social Security and Medicare taxes) on their income. In the same way, as a corporation elects S corporation status, an LLC elects S corporation status by filing IRS Form 2553 with the IRS. The election must be made no more than two months and 15 days after the beginning of the tax year when the election is to go into effect. This article on how a corporation elects S corporation status will give you more details. If you want your LLC to be taxed as an S corporation, you don't need to file Form 8832 to elect to be taxed as a corporation. The form directs you through a series of decisions and questions to a filing. The first section helps you to determine the eligibility of your business to apply for this change. The last section includes a consent statement and requires signatures. Due to the nature and complexity of the questions on this form, it might be best to go through it with the help of your accountant or attorney.